German jurist; born at Offenbach-on-the-Main Nov. 13, 1796; died at Darmstadt April 2, 1857. He first attended the gymnasium at Frankfort, and then the University of Heidelberg, from which he was graduated in 1817 as LL.D. After a supplementary course at Göttingen he began the practise of law at Darmstadt in 1820. In 1831 he became counselor of the treasury in the Ministry of the Interior, and in 1836 counselor of the cabinet, in which capacity he officiated as commissioner of the Hessian government in the Landtag. He became a member of the council of state in 1848, but was compelled to resign this office upon the outbreak of the Revolution. He was recalled, however, in 1849 as chief counselor of education, which position he held until his death. 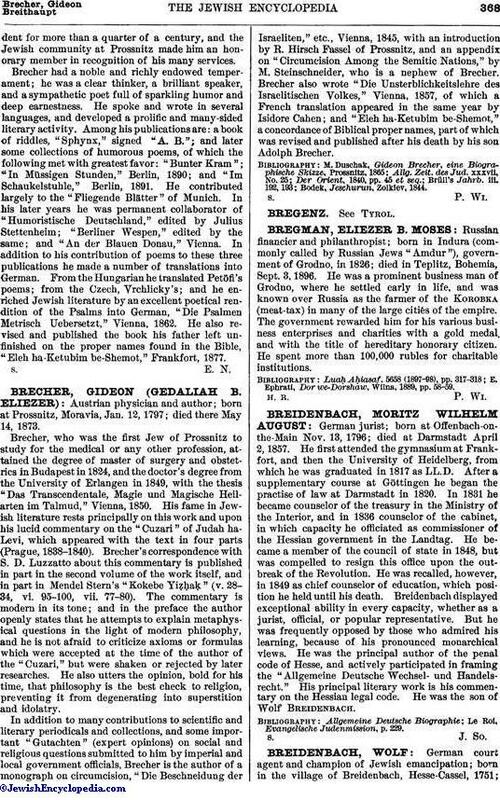 Breidenbach displayed exceptional ability in every capacity, whether as a jurist, official, or popular representative. But he was frequently opposed by those who admired his learning, because of his pronounced monarchical views. He was the principal author of the penal code of Hesse, and actively participated in framing the "Allgemeine Deutsche Wechselund Handelsrecht." His principal literary work is his commentary on the Hessian legal code. He was the son of Wolf Breidenbach. Le Roi, Evangelische Judenmission, p. 229.